any species of the genus Dentaria [Lat. dens=tooth, for the toothed rhizomes of some species], slender perennials of the family Cruciferae (or Brassicaceae; mustard family), native to north temperate regions. annual herb (Capsella bursa-pastoris) of the family Cruciferae (or Brassicaceae; mustard family), indigenous to Europe but now a nearly cosmopolitan weed in temperate regions. in botany, annual herb (Brassica napus) of the family Cruciferae (or Brassicaceae; mustard family), belonging to the same genus as the cabbage, the mustard plant, and the turnip (which it resembles in appearance). garden vegetable of the same genus of the family Cruciferae (or Brassicaceae; mustard family) as the cabbage; native to Europe, where it has been long cultivated. The two principal kinds are the white (Brassica rapa) and the yellow (B.
leafy garden vegetable of many widely dissimilar varieties, all probably descended from the wild, or sea, cabbage (Brassica oleracea) of the family Cruciferae (or Brassicaceae; mustard family), found on the coasts of Europe. hardy perennial European herb (Nasturtium officinale) of the family Cruciferae (or Brassicaceae; mustard family), widely naturalized in North America, found in or around water. herbaceous plant (Raphanus sativus) belonging to the family Cruciferae (or Brassicaceae; mustard family), with an edible, pungent root sliced in salads or used as a relish. common name for two plants belonging to different families in the plant kingdom. One, an annual desert plant (Anastatica hierochuntica) of the family Cruciferae (or Brassicaceae; mustard family), is native to Asia Minor. It is a resurrection plant. Mediterranean perennial (Cheiranthus cheiri) of the family Cruciferae (or Brassicaceae; mustard family), particularly popular in Europe, where it flourishes on old walls. , any species of the genus Alyssum of the family Cruciferae (or Brassicaceae; mustard family), annual and perennial herbs native to the Mediterranean area. A few species, notably the perennial golden tuft (A. All mustards are edible and have very powerful healing qualities. Mustard is said to be one of the best things to prevent cancer in the body. It is one of the ingredients of curry (the other is turmeric) and is eaten a lot in India, which has one of the lowest rates of cancer. Yellow flowers, thin upward pointing thin stick-like seed pods. Unopened flower buds resemble broccoli because they are related. The compounds in mustard are so strong, even tiny amounts are said to have a noticeable effect on breast and colon cancers. It helps cancerdamaged cells to self-destruct so the cancer can’t spread. Mustard is used for asthma, athlete’s foot(ringworm), fungus, parasites, sinus congestion, headache, gas, colds, hemorrhoids, high blood pressure, infection, rheumatism, stress, rash, ulcers, stomach cramps, toothache and muscle pain. Mustards love colder weather (spring and fall) and can be easily grown in your garden. It's a nuisance to farmers because it grows everywhere. Wait till the seed pods get hard, yellow and dry, put a plastic bag or pillow case around the plant and hit it with something hard , all the little tiny black seeds fall out into the bottom of the bag. Pull the stalk out. Mustard is actually a type of grass, so it grows bi-annually. One way to identify a plant from the mustard family (all of which are edible) is the flowers have 4 petals with 6 stamens–4 tall and 2 short. Seedpods always resemble a spiral staircase going up the stem and leaves emit a mustard odor when crushed. A great part to eat aside from the young leaves is the entire "growing tip"- the cluster of unopened buds and opened flowers which looks a little like broccoli. The pungent leaves can be mixed in salads, stir frys or added raw to a smoothie for some serious nutritional and healing power. Simple Mustard 1 cup mustard seeds- soak a bit in cold water to activate “hotness” 1/3 cup apple cider vinegar mix in Vitamix (strong blender) or mortar and pestle or grind seeds first in coffee grinder, then add some cold water, wait a bit, then mix paste with vinegar. You can also add some olive oil, turmeric, sea salt, pepper, raw honey or lemon if you want. Oil lessens the hotness. plant species of Sinapis, family Cruciferae, and also several species of the genus Brassica. The genus Sinapis numbers seven to ten annual, or more rarely perennial, species, distributed in Europe, North Africa, and Asia. They are predominantly weeds with leaves ranging from entire to notched (with lyrate lobes) or dissected and yellow (rarely yellow-white) blossoms. The fruit is a bivalvular pod with from three to seven noticeable ribs and a long rostellum. In the USSR there are two or three species. When it is cultivated, white, or English, mustard (S. alba) is an annual branching plant 25–100 cm high. The blossom cluster is multiflorous. The pod, with its flattened (ensiform) rostellum, is on a pedicel that slants sharply from the stem. The seeds are pale yellow or light brown; 1,000 seeds weigh 4–7 g. In its uncultivated state it is a weed. Wild mustard, or charlock (5. arvensis), grows almost everywhere in the USSR. The pods have a conical sharp-edged rostellum; the pedicels with fruit reach obliquely upward. The seeds, which produce weeds in cultivated crops, are reddish brown or black and retain their germinating power for ten years. Mustards of the genus Brassica include three cultivated annual species. Indian mustard (B. juncea) is a branching plant up to 1.5 m tall. The lower leaves are notched (with lyrate lobes), and the upper ones are entire. The blossom cluster is usually corymbiform. The pod is tuberculate, with a noticeable middle rib and a subulate rostellum, slanting away from the stem at a sharp angle. The seeds are yellow, cinnamon-brown, or chestnut-brown; 1,000 seeds weigh 1.8–4.5 g. It is grown in Europe and Asia (including the USSR). Black mustard (B. nigra), which has pods tightly pressed to the stem, is cultivated in Europe, Asia Minor, and America. In the USSR it is a weed. Abyssinian mustard (B. carinata) is cultivated in Ethiopia and the mountains of East Africa. Also included among the mustards is sea rocket (Cakile maritima), a wild annual species of the family Cruciferae. Mustard is grown to obtain a fatty oil from its seeds (35—45 percent in Indian mustard seeds; 20–34 percent in white mustard seeds), which is used in the bread-baking, confectionery, canning, and perfume industries; also obtained is a volatile (allyl) oil, used in medicine in the form of spirit of mustard (a 2 percent solution of the oil in alcohol) as an external stimulant and revulsant. The mustard powder obtained from mustard cakes is used to prepare mustard plasters and table mustard. Root-crop and leafy varieties of Indian mustard are eaten as vegetables. White mustard may be fed to livestock until the beginning of pod formation. All mustards are good nectar bearers. Indian mustard was first cultivated in Southwest Asia, and white and black mustard in the Mediterranean countries. In Russia, mustard (predominantly Indian mustard) began to be cultivated in the 18th century. In 1970 the area under mustard cultivation in the USSR (Lower Volga, Kazakhstan, Stavropol’ Krai, Novosibirsk Oblast, etc.) consisted of 221,000 hectares (ha). Mustard yields 3.9 centners/ha. Regionalized varieties grown include VNIIMK 162, Neo-sypaiushchaiasia (nonshedding) 2, and Volgograd 189/191. Mustard is planted after winter crops, legumes, or intertilled crops. Approximate norms for mineral fertilizers (in kg/ha) are: 30 N, 45–60 P205, and 30–45 K20. It is sown in rows 15 cm apart, the seeding rate is 6–8 kg/ha, and the depth of sowing is 4–5 cm. Care of plantings includes harrowing until germination (if a crust forms), weeding, and controlling pests (the cress flea beetle, turnip sawfly, and others) and diseases (powdery mildew). 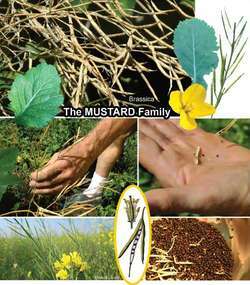 Indian mustard is harvested at the beginning of wax ripeness of the seeds. White mustard is grown in the USSR in the nonchernozem zone (up to 62° N lat.) in negligible quantities. Velichko, V. V. Belaia gorchitsaν nechernozemnoi polose. Moscow, 1951. Minkevich, I. A., and V. E. Borkovskii. Maslichnye kul’tury, 3rd ed. Moscow, 1955. Sazanova, L. V. Kul’tura sareptskoi gorchitsy. Moscow, 1955. Any of several annual crucifers belonging to the genus Brassica of the order Capparales; leaves are lyrately lobed, flowers are yellow, and pods have linear beaks; the mustards are cultivated for their pungent seed and edible foliage, and the seeds of B. niger are used as a condiment, prepared as a powder, paste, or oil.